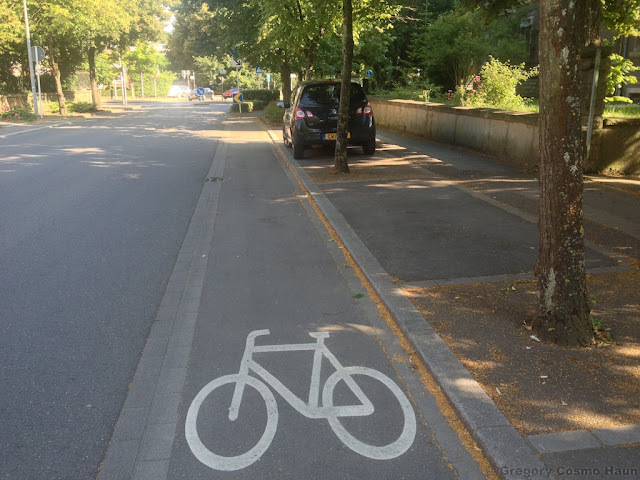 Esch-sur-Alzette, Luxembourg – This could be applicable in a lot of places: make room for bikes by putting the parked cars in between the trees in the sidewalk 'furniture zone'. 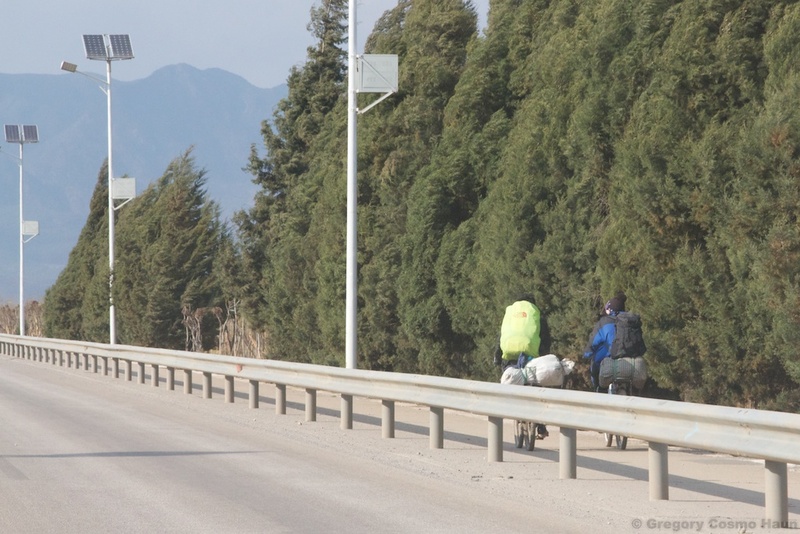 Near Lijiang, Yunnan, China – Put the bikes on the safe side of the crash barrier. Duh. 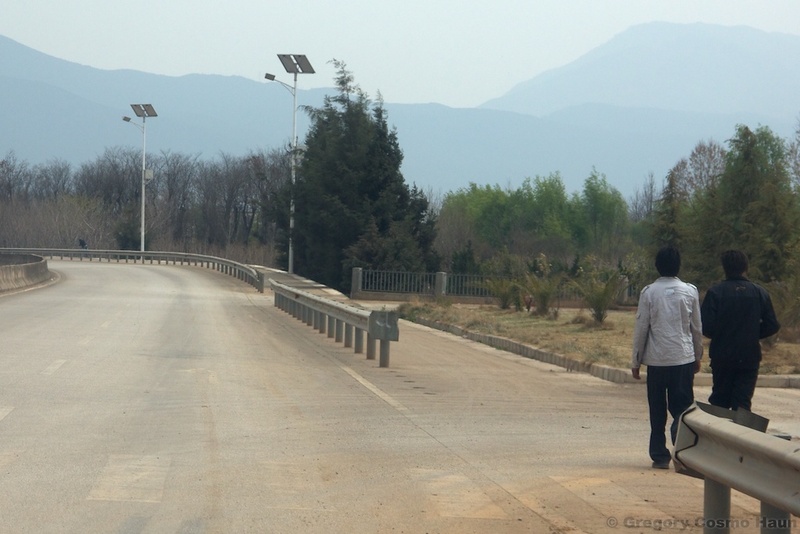 Solar LED street lights a nice touch too. 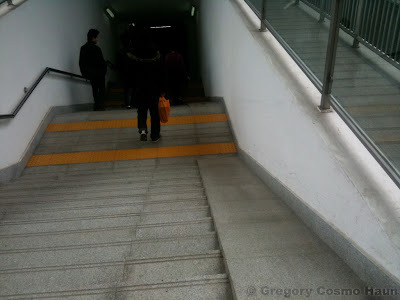 Guangzhou, China – I don't understand why barriers like these aren't common everywhere. 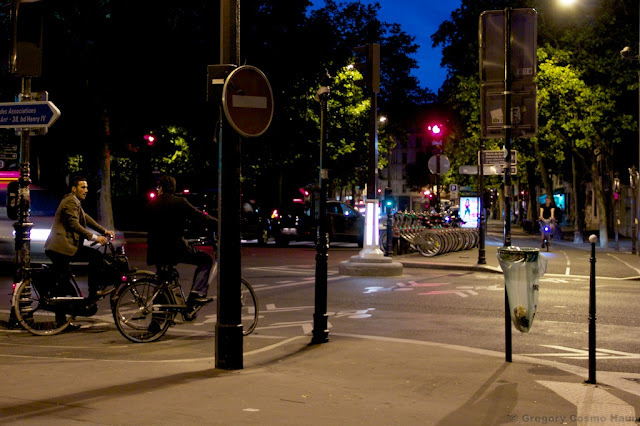 Paris, France – Cycletrack, bike sharing station, and Parisian cyclists. This is what you get when you have the space and money to do things right. 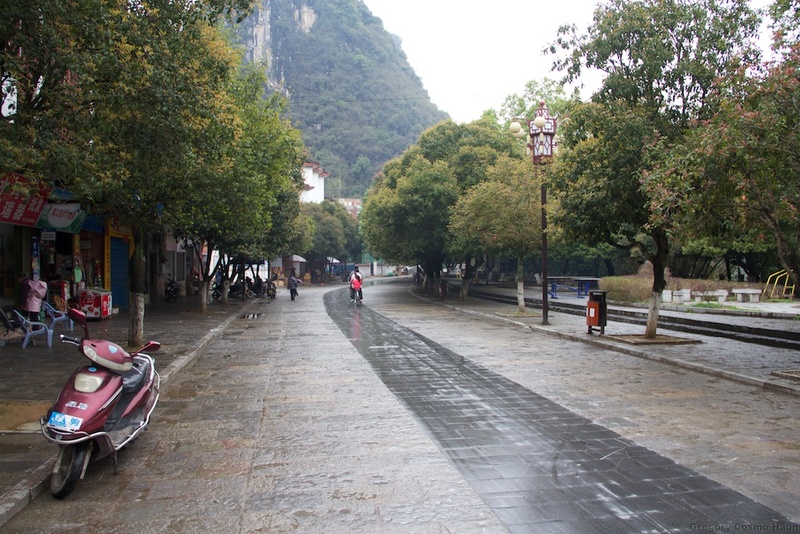 Yangshuo, Guangxi, China – Smooth central section for bikes and motorbikes. Kudos to Portland for their solution to bikes on cobblestones. Guangzhou, China – Nice big ramp for rolling your bike down the stairs. 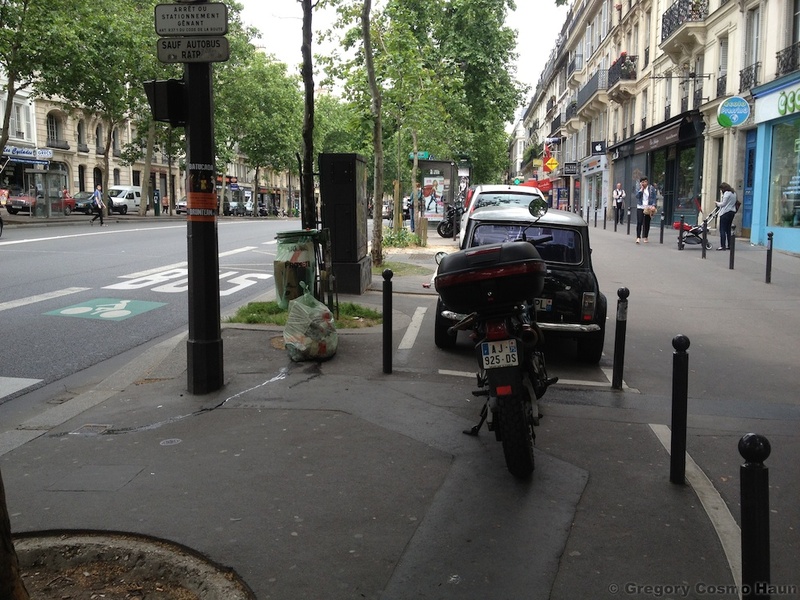 Paris, France – What do you do when there's not enough room 'curb-to-curb' for bikes? Let the bikes ride in the bus lane and park the cars on the sidewalk. Actually works in Paris where people appear accustomed to negotiating the mix of walking and driving. One other interesting thing of note in the Esch photo... it's hard to see but in the upper left corner you can see a glimpse of the bike lane on the other side of the street, which is at sidewalk level, but is outside the tree area, where you would ordinarily expect cars to be parked. 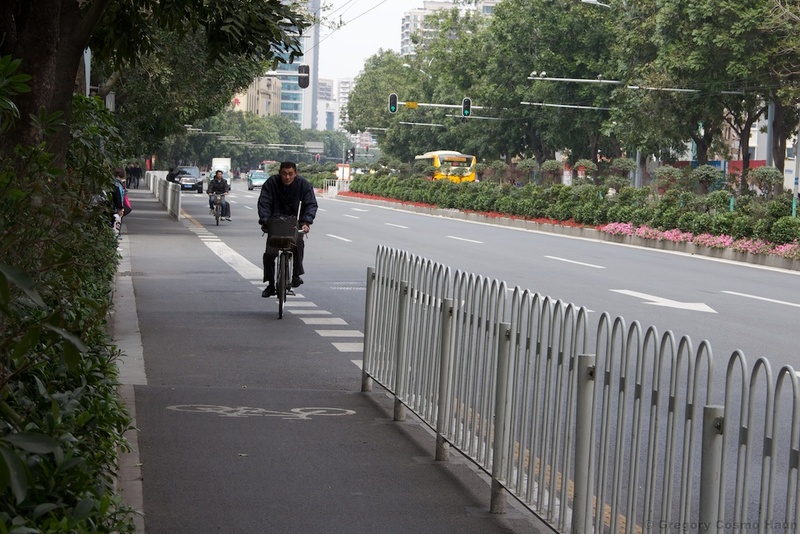 This provides a bit of physical separation between drivers and cyclists without the clutter of a taller barrier. It also keeps cyclists well clear of the pedestrian zone. This probably works better when there is no street parking, or the street parking is between the trees as shown in the photo. © Gregory Cosmo Haun. Simple theme. Powered by Blogger.